When I was conducting research at the Folger Shakespeare library in June, I saw this recipe for “Carraway Bunns” in Mary Hookes’s manuscript recipe book V.b.342. I love caraway. I love buns, rolls, scones, biscuits, popovers, and trying out yeasted bread recipes (like these “Oven Cakes“). As I prepared to cook “Almond Jumballs” with paleography students at the Folger, I added this recipe to my running list along with the “Snow Cream” I tried in July. Last week I wanted to bake something warm, buttery, and doughy. (I felt a little bit like the woman in this Onion article.) 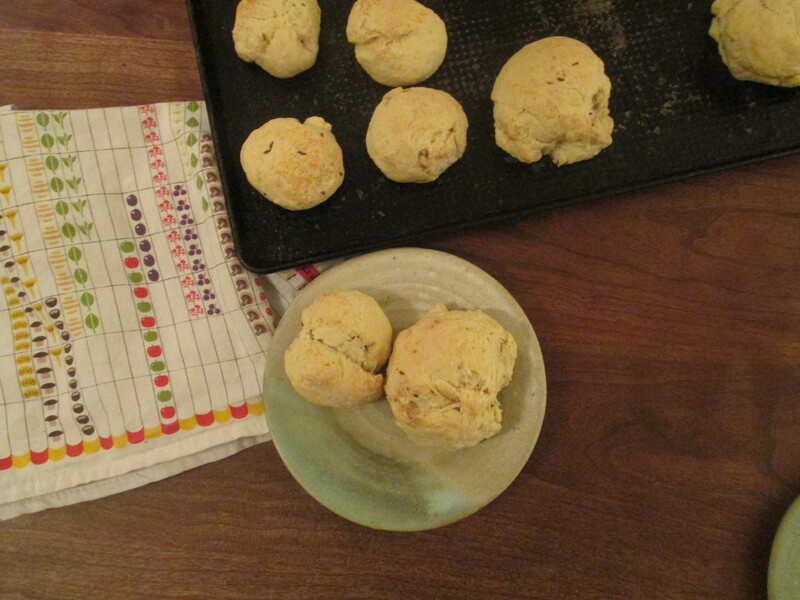 As I transcribed this recipe, I realized that it was rather similar to my mother’s recipe for Herb Biscuits. Her rich rolls appeared on our Thanksgiving table smelling of sage, onion, and speckled with celery leaves. Seasoned with caraway instead, these buns were just the thing. 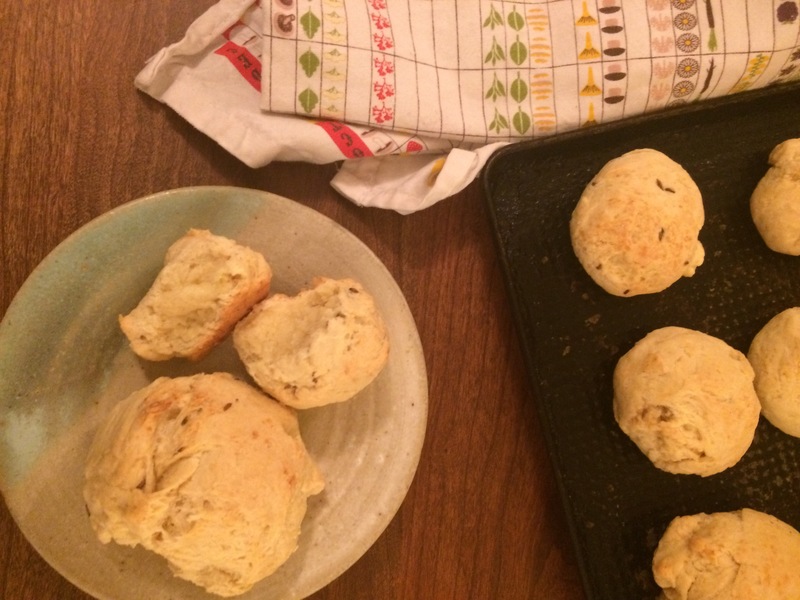 Like a rich, yeasted biscuit (or scone), these buns are an excellent accompaniment to hearty fall dinner or a luscious snack with afternoon tea. Att Bottome then they are Enough. The recipe calls for caraway comfits, or sugar coated caraway seeds. I’ve made fennel comfits before (see below), but coating these small seeds in sugar syrup is tricky, fiddly work that I wasn’t up for last week. I used regular caraway seeds instead and increased the sugar. While Alyssa wrapped up things at work and walked over to my place for our cooking date, I put together this rich dough and left it near the warm oven to rise. (I was roasting some broccoli for dinner.) Halved, the recipe made 5 small buns and 6 large buns. Heat milk. Sprinkle in yeast and let stand for two minutes. Combine the flour and butter. You can do this in a mixer with a dough hook or in a sturdy bowl. Add the yeasty milk, then the egg, then the salt and dough should form. *Next time I will incorporate the sugar and caraway seeds in this initial mix. * Either keep running the mixer or turn the dough and any unincorporated bits out onto a floured board and knead for a few minutes. When the dough is smooth, cover with a towel and leave to rise in a warm place for an hour. Punch down the dough and sprinkle in sugar and caraway seeds. *This is what I did with the test batch, but next time I’ll add these earlier. * Form buns and put on a greased baking sheet. I left these to sit for a few minutes before baking, next time I might give them a second rise of an hour or so. Bake for 20-25 minutes until the bottom and top are both golden brown. Make a pot of tea while they’re baking. Devour. Delicious, dense, buttery “buns.” They have the crumb of a good biscuit or scone from the butter and a hint of fluffiness from the yeast. But some bites were full of caraway and others were sharply sweet. Next time I’ll incorporate the seeds and sugar from the start. I think there are a lot of ways to adapt this recipe as well. If you don’t like caraway, use fennel or sage or celery salt or orange zest. If you want to make these sweeter, increase the sugar and consider adding an egg wash and sprinkling sugar and seeds on the top to make a tasty and stunning crust. I’ll be keeping this one on my list. Un vrai voyage cette gourmandise !! These look marvelous fun to make. I’ll save this and try it with whole wheat flour and sourdough starter, since that’s all I keep in my kitchen. I imagine they’ll be wonderful. Thanks so much! Sharing. This looks like a lovely receipt. One of the things that always puzzled me was why 18th century cooks used caraway seeds in their cakes and biscuits. We don’t use them now in that way. Then I started to do a little research on the cost of spices in the 18th century, which would have had to come half way around the world to get to Europe. Their cost reflected the hundreds of middle men that were handling them. Things we now use often like cinnamon and nutmeg were then only available to the very rich. On the other hand, ANYONE can grow caraway. It is an umbelliferous plant like fennel or anise and produces abundant seeds. I’ve even seen it growing wild along the roadside in Pennsylvania Dutch country in Lancaster County, having escaped from the garden. This is PURE SPECULATION on my part, but I think it makes sense. Mercy, I completely agree and I’ve thought similarly for quite a while. Caraway provides bold flavor and it can be grown locally!